The US is attempting to fire up a fresh round of Middle East peace talks in an attempt to head off a major diplomatic embarrassment over a looming Palestinian request for recognition of statehood at the United Nations. Washington has again dispatched negotiators to meet Palestinian and Israeli leaders as it scrambles to find ways to avoid carrying out a threat to veto a Palestinian request for full membership of the UN, which is expected to be made to the security council or the general assembly next week. If the request is made to the security council, a US veto of Palestinian demands for statehood – on the grounds that two decades of negotiations has failed to end the occupation – is likely to further damage America's already battered reputation in the Middle East, particularly when Washington has strongly backed the uprisings in Libya and Syria and broadly welcomed the Arab spring. The US is working with Tony Blair, special envoy of the quartet of the UN, EU, US and Russia, to come up with a framework for talks that could lure the Palestinians back to the negotiating table. US envoys David Hale and Dennis Ross, the European foreign policy chief Catherine Ashton and Blair are due to meet Palestinian and Israeli leaders. But Washington is also seeking support from Britain in particular in its stand against the Palestinian resolution, if it does come to a vote at the UN. Two other security council members, Russia and China, have openly backed the Palestinian move. France is sympathetic to the Palestinian demand but is seeking a compromise resolution that could be supported by Germany, which is opposed to UN recognition of a Palestinian state, in the hope of forging a common EU position. Britain has so far not declared how it would vote, but diplomatic sources say that it is torn between American pressure to support the US position in the security council and concerns about what such a move would do to the UK's standing in a changing Middle East, particularly while it is still heavily involved in Libya. Israel was also making last-minute efforts to persuade undeclared countries not to vote for a Palestinian resolution, amid threats to tear up previous agreements, impose financial penalties and annexe West Bank settlements if the Palestinians go ahead. Obama confirmed the US would veto any request brought before the security council, describing the Palestinian push as "counterproductive". But the White House wants to avoid such a step, knowing it will play badly among Arabs whose own moves for self-determination this year Obama has endorsed. In Washington, the US House of Representatives foreign affairs committee opened a hearing on Wednesday into whether American aid to the Palestinian Authority should be discontinued. Some members of the overwhelmingly pro-Israel US Congress have been pressing for a cut off in aid if the Palestinians submit their request to the UN. However, there is concern among others that such a move would leave Israel to pick up a greater share of the cost of occupation. The European Union is at the centre of the efforts to avoid diplomatic meltdown. Its belief that only a negotiated settlement can resolve the Israeli-Palestinian conflict is given added force by its desire to avoid a damaging split among its 27 members. But efforts to secure a breakthrough are constrained by Palestinian demands of guarantees that any talks would be based on the pre-1967 borders, plus a total settlement freeze. Israel is unlikely to sign up to that. The Palestinians insist their approach to the UN does not preclude a return to negotiations later. "We see no contradictions between doing both," said Dr Mohammad Shtayyeh, a senior member of the team heading to New York. The UN bid was "the beginning of the game, not the end," he said. "It is a process." In public, Palestinian officials are standing firm in the face of "very serious pressure" to backtrack. Privately, there are suggestions of wavering. However, the International Crisis Group warned this week that any climbdown now "could decisively discredit [Mahmoud Abbas's] leadership, embolden his foes and trigger unrest among his people". It went on: "Most Palestinians do not strongly support the UN bid; but they would strongly oppose a decision to retract it without suitable compensation." Israel has engaged in its own diplomatic offensive to try to derail the Palestinian bid, instructing its diplomats around the globe to campaign vigorously for votes and lavishly hosting delegations from undeclared countries. But Ron Prosor, Israel's ambassador to the UN, acknowledged that the "battle to stem the tide" was lost, and warned that "this unilateral course of action won't lead to peace and won't lead to the establishment of a Palestinian state". 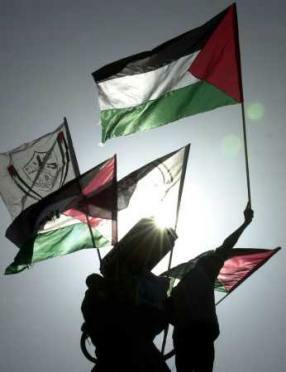 The Palestinians reject the claim that they are acting unilaterally, saying the UN path "is the ultimate expression of multilateralism". They add that Israel's apparent opposition to unilateralism has not stopped it acting without agreement, such as building and expanding settlements. Sallai Meridor, a former Israeli ambassador to the US, said the move "weakens the chances for negotiation and agreement and increases the chances of frustration and violence. For Israelis it will strengthen the voices saying there is no one to talk to. Once you act unilaterally, the chances for negotiations are much lower." Israel is also alarmed at the prospect that the Palestinians could bring a case against it at the international criminal court, a possibility that would open up with enhanced UN status for the Palestinians. "No Israeli government could negotiate if it has criminal proceedings hanging over its head," said a former official. Retaliatory options raised by Israeli ministers should the Palestinian bid succeed include tearing up the Oslo accords, under which the Palestinian Authority was given control of parts of the West Bank and Gaza, annexing the West Bank settlements and withholding tax revenues that Israel collects on behalf of the PA. The US Congress is also threatening to cut off financial aid to the Palestinians. Violence in the aftermath of the UN move has been predicted by the Israelis for months, despite Abbas's insistence that any demonstrations would be peaceful. "Non-violent demonstrations have a high risk of developing into something violent regardless of planning," said Meridor. "When you take gasoline and play with matches, you run the risk of a big fire." The Israeli security forces have restocked with crowd-dispersal equipment, including teargas, rubber bullets and water canon. They are also training and arming settlers, fuelling fears on both sides that hardline elements could provoke violence.